Ceramic tiles feature soft white tones and contrasting greiges reminiscent of natural hardwood to create this elegant wood-look tile. SOLD BY BOX OF 16 Sq Ft.
Carolina Timber White 6 in. x 24 in. Glazed Ceramic Tile adds a touch of earthy extravagance to your space. 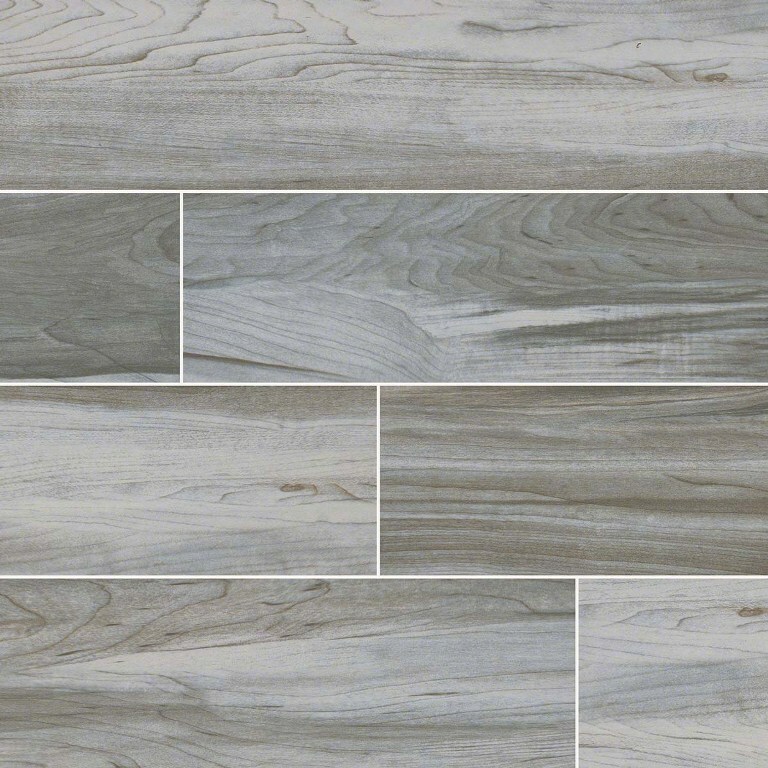 Featuring soft white tones and contrasting greiges, this neutral hued tile offers veining and graining that replicates the look of rich, exotic tigerwood. It's suitable for residential and light commercial applications including floors, walls, and countertops. Use it as backsplash tile to add unexpected detail to your decor. This matte finished, low sheen ceramic tile is an especially good choice for kitchens and baths, as it is easy to clean, doesn't harbor germs, and it's highly durable. In addition, it's also impervious to water and stain penetration. This is a rectified tile, mechanically finished on all sides to achieve uniformity. Its precise sizing allows for a thinner grout joint, which results in a clean, professional install and reduces staining issues. Carolina Timber White 6 in. x 24 in. ceramic tiles feature soft white tones and contrasting greiges reminiscent of natural hardwood to create this elegant wood-look tile. These beautiful, low-maintenance wood tiles are suitable for a wide array of interior projects including floors, accent walls throughout homes and light use commercial properties. It was too brown for what I need...I was looking for more grey. Product sample was delivered quickly and quality was good.